"Simone Young's ability to shape a phrase is remarkable, and something she has come to via the time-honoured European route of Kapellmeister; working with singers as repetiteur, accompanist, colaborator and leader. Her performance with Steve Davislim on this recording is a perfectly judged balance between the analytical and the rapturous. Every detail in Strauss' accompaniment speaks with perfect clarity while never overbalancing and always allowing Davislim's golden tenor voice by turns to soar or float above the orchestral texture. Richard Strauss began to compose songs when he was six years old. Although the beginning of his mature Lieder composition is usually dated from his Op.10 Gilm settings of 1885, he wrote over 40 songs before that, several of them of high quality. He was encouraged by his aunt, Johanna Pschorr, who apparently was a singer good enough, had she wished, to have had a professional career. Later, of course, he taught and then married the soprano Pauline de Ahna who, not withstanding (indeed, perhaps because of) her volcanic temperament and impulsive outspokenness, in contrast to his own phlegmatic outlook, was the perfect wife for him. They first met in 1887. Two years later she joined his opera company at Weimar where she sang most of the leading soprano roles and created the heroine of his first opera Guntram in 1894 just before they were married – the same year in which she sang Elisabeth in Wagner’s Tannhäuser at Bayreuth. She retired from the opera stage in 1895 but continued until 1906 to give recitals, usually, but not exclusively, of her husband’s songs. He accompanied her at the piano or conducted when she sang his songs with orchestra. He regarded her as his finest interpreter and she undoubtedly advised him on his operatic roles throughout their life together. The effect on him of her voice can be gauged from the fact that between 1885 and 1906 he composed 112 songs, most of them in the period 1899–1901. They had been happily married for 55 years when Strauss died on 8 September 1949. She survived him, a broken woman, for only nine months. Not all his songs, of course, were written for the soprano voice. “Heimliche Aufforderung“ (Secret Invitation) (Track 1), although the third of the four Op.27 songs which Strauss gave to Pauline on their wedding day, is a man’s song, as its text implies. It appropriately comes first, on a disc entitled Seduction, with its reference to a “secret sign” which the lover awaits for their tryst in the garden. Two more of Op.27 are included here. “Ruhe, meine Seele!“ (Track 4) was not orchestrated until June 1948, 54 years after it was written. In this version, it is darker and more tragic. The words “Rest, my soul” had a new meaning for him as death approached and the line “these are momentous times” applied equally to the world situation and to his own post-war humiliations. “Morgen!“ (Tomorrow) (Track 5) is probably his best-known and perhaps his most beautiful song, a rapturous, almost religious evocation of love’s bliss. The orchestration, with its tender violin solo, dates from 1897. The entry of the voice still takes the listener by surprise however often one hears it. “Ständchen” (Serenade) (Track 3), another of Strauss’s most popular songs, comes from his Op.17 settings of the poet Count Adolf von Schack and was orchestrated in 1912 by the conductor Felix Mottl. Although Strauss came to deprecate its popularity, he must have remained proud of the easeful melody and delightfully airy accompaniment. In total contrast is “Traum durch die Dämmerung“ (Dream in the Twilight) (Track 7) composed in 1895 (and orchestrated by Heger in 1932), the poem by Strauss’s Munich contemporary Otto Bierbaum. Its haunting melody, the essence of nostalgia, is quoted by Strauss in the “Works of Peace” section of the tone-poem Ein Heldenleben. Hail to the day when first I beheld you! “Das Rosenband“ (The Rose Garland) (Track 11) is a setting of a poem by Klopstock which had been set by Schubert. Strauss composed his version in 1897 and it was first sung by Pauline in Brussels in November 1897. It was written for voice and orchestra, the piano version (by Strauss) following later and eliminating much of the delightful detail of the full score. It is another tender love song. It is probable that Pauline was also the first singer of “Freundliche Vision“ (Friendly Vision) (Track 14), another Bierbaum setting which Strauss once singled out as one of his Lieder in which he thought she was incomparable. It is the first of a set of five songs of Op.40, composed in 1900. Its warm harmonies aptly illustrate the vision of the “white house in the green bushes” where the man is walking “with the one who loves me, quiet of spirit” (Pauline was anything but quiet of spirit). Strauss’s orchestration dates from 1918. With “Befreit“ (Set Free) (Track 12) we come to one of Strauss’s very greatest songs, composed in 1898. The poet, Richard Dehmel, thought the music was too “soft-grained” but few would agree. The refrain “O Glück!“ (“O happiness“), thrice repeated, is of special poignancy. Strauss quoted this song, too, in Ein Heldenleben. He orchestrated it for Ursuleac in 1933. “Wiegenlied“ (Cradle Song) (Track 13) is also a Dehmel poem (set later by Reger and Pfitzner) and was a favourite with Pauline. She gave the first performance of the orchestral version at Elberfeld in July 1900 (the piano version was written a year earlier). The melody is one of Strauss’s loveliest and simplest and he advised that the tempo of the arpeggiando figure in the accompaniment, for three violins (later violas), should be “changeable like a woman’s favours” (depending on the singer’s breath-control!) “Waldseligkeit“ (Woodland Bliss) (Track 15), again by Dehmel, although composed in 1901 and dedicated “to my beloved wife” waited until 1918 to be orchestrated. Its two verses of nature painting invited the magical tone-colours of this score but there is amorous rapture in the last line “Yours and only yours”. “Die heiligen drei Könige aus Morgenland“ (The Three Holy Kings from the East) (Track 16) is one of Strauss’s few religious songs and was one of Heinrich Heine’s few religious poems. Written for voice and orchestra in 1906, the song is dedicated to Strauss’s mother, who (unlike her son) was deeply devout. It is like a vocal tone-poem. It begins with a long introduction for lower strings describing the Three Kings’ wanderings. The star (celesta and harps) guides them to Bethlehem and we hear the ox’s bellowing and the Child’s crying (it is a Holy Family Domestic Symphony). A typical surge of Strauss melody illustrates the song of the Three Kings and leads into a glowing orchestral postlude. “Actually, I like my songs best”, Strauss said in old age, but they are still under-estimated although singers today are exploring more of their riches. To the general public, his operas are still better known and this disc ends with two operatic extracts, both without voices! The “Moonlight Music“ from his last opera Capriccio (1940–1) (Track 17) contains the glorious piano melody Strauss borrowed from his 1918 song-cycle Krämerspiegel (Shopkeeper’s Mirror) and transformed into orchestral magic to introduce the closing scene of the opera in which the beautiful Countess Madeleine enters her salon alone to decide whether she loves the poet (words) or the composer (music). 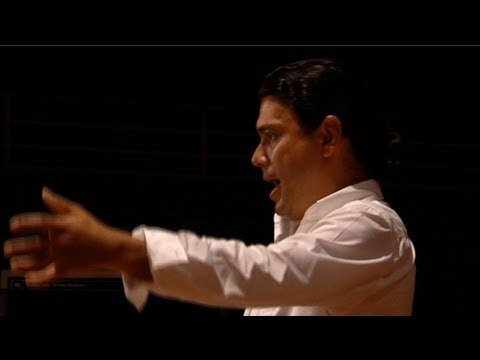 This was the last piece of his own music that Strauss conducted. The “Second Waltz Suite“ from his most popular opera, Der Rosenkavalier (Track 18), was authorised and annotated by Strauss in 1911, the year of the first performance, and is concocted from the waltzes of Act 3. Seduction is dedicated to the memory of Francis Joseph Barzyk (1962-99), a virtuoso tubist and former member and admired colleague of the State Orchestra of Victoria and the Orchester Opernhaus Zürich. Francis Barzyk was a musician of rare sensitivity and a radiant light in the lives of all who were privileged to know him.